Amherst is located in Hampshire County and is part of the Pioneer Valley. It is one of the few towns that doesn’t have a mayor-council, but is upheld by a traditional system, having representative town meetings and a select board. Amherst offers quality education, lots of culture, a high level of government services, plenty of agriculture and so much more. Amherst is mainly known for its farmland and academics. It’s agricultural scenery helps give it a country feel and provides plenty of local produce. Amherst is a diverse town offering plenty of educational opportunities. Public schools are part of the Amherst-Pelham Regional School District. It is also home to Umass Amherst, Amherst College and Hampshire College, 3 of the “Five Colleges.” Therefore, getting a higher level education will be within reach with all of these great colleges being so close. The town of Amherst offers plenty of entertainment possibilities to its residents. Catch an independent film at the Amherst Cinema Arts Center. If you love arts and culture, you will surely enjoy visiting one of the many museums in town including the Beneski Museum of Natural History, the Emily Dickinson Museum, Eric Carle Museum of Picture Book Art, and the Mead Art Museum at Amherst College. If you love reading, you will enjoy the Yiddish Book Center or visiting the W.E.B. Du Bois Library located at Umass Amherst. Amherst is also just a short drive to the brand new MGM casino in Springfield, MA. Worried about employment? Well, rest assured. Amherst offers many different employment opportunities within the town. The largest employers are Amherst College and Delivery Express, but there are plenty of other great businesses in the town always looking to hire. Hampshire College and Umass Amherst offer plenty of employment options as well. The Town of Amherst is always hiring as they are committed to providing an all-encompassing government and excellent services to their residents, making it a great place to work. 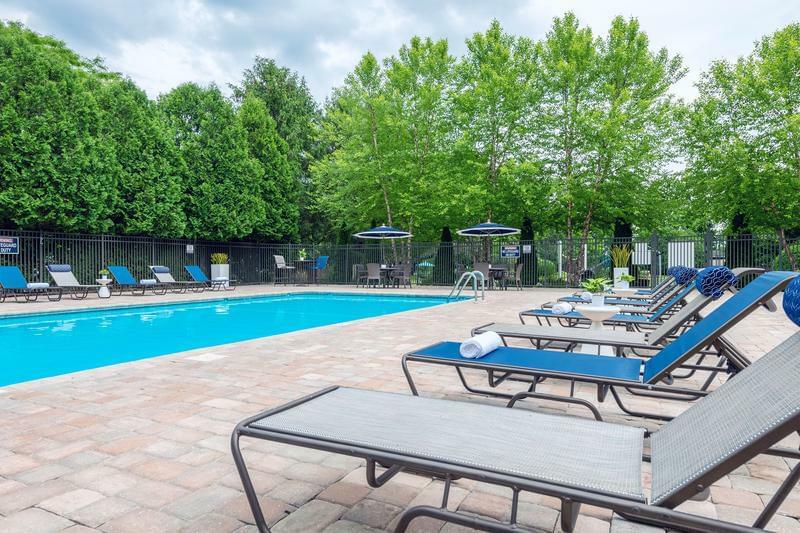 Aspen Square Managements offers apartments for rent near Amherst at Alpine Commons, Aspen Chase Apartment Homes and the Sugarloaf Estates.Alpine Commons and Aspen Chase are the only communities in Amherst with all-inclusive rent! Both of these apartment complexes in Amherst, MA include utilities in most apartment styles. Alpine Commons features studio, 2, 3, and 4 bedroom apartments whereas Aspen Chase offers 1, 2 and 3 bedroom apartments. Sugarloaf Estates offers 2 bedroom apartments and the community features a resort-style pool, a 24 hour fitness center and so much more. 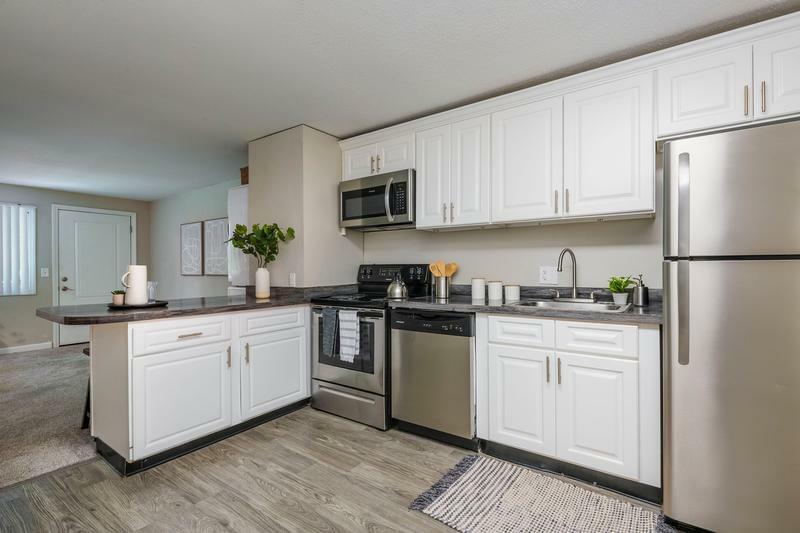 All our apartments feature modern kitchen with white cabinetry, granite-style countertops and stainless steel appliances. Don’t forget, we offer pet friendly apartments, so you will be able to bring your furry friend along with you. Aspen Chase offers an on-site laundry facility and even includes washer and dryer appliances in select apartments. Alpine Commons includes private patios or balconies. Both of these Amherst apartment communities are located on the PVTA bus line and are located just minutes from UMASS Amherst, making it a great destination for off campus housing. 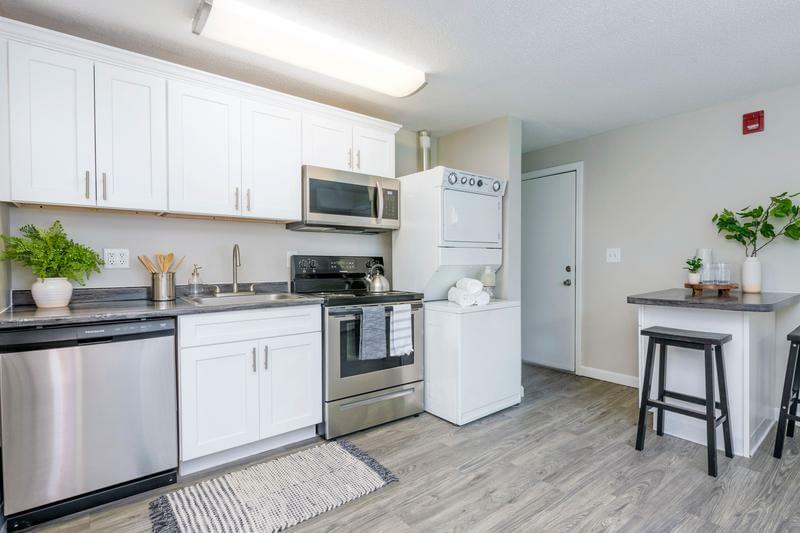 These student apartments for rent in Amherst, MA will leave you close to everything, with transportation at your fingertips. What are you waiting for? Come and see why our Amherst apartments for rent are so special!